Heavy snowfall and the resulting flooding has led to a state of emergency being declared at Saddle Lake Cree Nation, where some roads are now impassable. A state of emergency has been declared at Saddle Lake Cree Nation after melting snow flooded gravel roads, making some so waterlogged they're impassable. 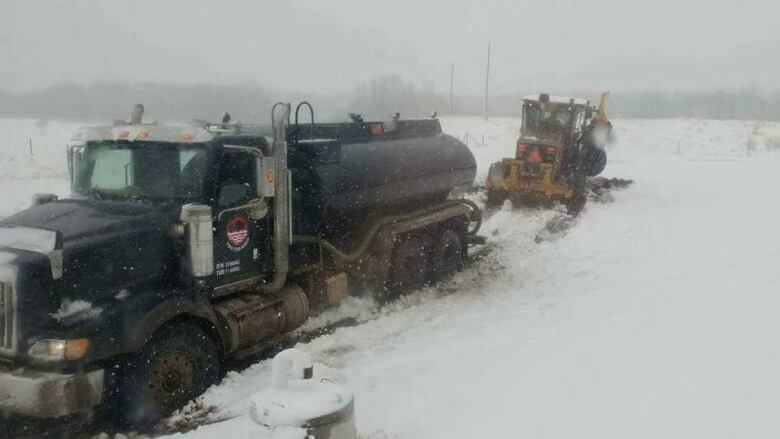 The state of emergency was declared April 16 because the trucks that deliver water to band members kept getting stuck in the sludge. There are about 470 band members who rely on the water trucks for drinking water. "I'm 50 years old and haven't ever seen anything like this," band Councillor Leslie Steinhauer said Wednesday. The First Nation, about 170 kilometres northeast of Edmonton, was hit with heavy snowfall last week. Steinhauer estimates about a foot of snow fell in total on Thursday and Friday, before melting and turning the roads into a muddy mess. "There is mud up to your axles of our trucks, you can't drive, it's spongy," Steinhauer explained. Everyone on the First Nation is being told to conserve water as much as they can while the state of emergency is in place. The band leadership is making bottled water available at the local fire hall for those who can get to it. But even those who have four-wheel drive vehicles have been getting stuck in the mud. Steinhauer said a public works crew and disaster team are also taking bottled water to people by using four wheel drive trucks, and even all-terrain vehicles. "The roads are even washing out in some areas and causing our community members to break down and get stuck," he said. Even though it snowed again Wednesday, Steinhauer said weather conditions seem to be improving. The First Nation will assess the damage to the community after the state of emergency is lifted. The Kehewin First Nation, south of Bonnyville, declared a state of emergency April 15, after heavy snow knocked out power and water.